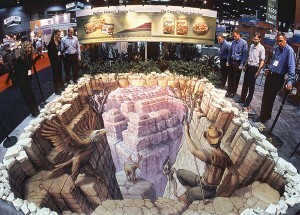 I did this piece at the American food fair in Chicago. This is a trade show for the “food industry” that is not really open to the general public. The work was bordered with real plants and rocks that provided a nice transition to the carpeted floors. Thousands of square feet of carpeting are used for these events, which only last for several days. It is not a complete waste, however, as the nearly unused carpet is donated to schools and charities. It was a busy couple of days because it included the production of a time-lapse video. This adds a significant amount of work to a project because I have to sit in positions that are often uncomfortable in order to avoid blocking the camera angle. I also need to work for long periods and cannot break whenever I want. Still, it is rewarding to see the footage because it documents the flow of the work.